"You will take the Dalek factor. You will spread it to the entire history of Earth!" The three new Daleks continue to play with the Doctor engaging him in a game of trains pushing him round the room. The Doctor explains that he and Jamie are their friends and gives them name & a marking: Alpha, Beta & Omega. All the Daleks are recalled to Skaro. Maxtible tells Waterfield Victoria has been released and Waterfield searches for her while Maxtible packs a bag. 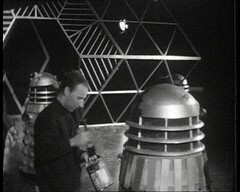 He discovers a device on the floor: a Dalek Time bomb. He is dismayed that the Daleks intend to destroy his lab. 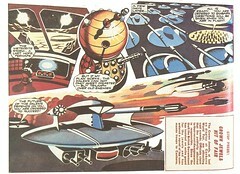 Waterfield returns and attacks Maxtible but Maxtible knocks him out and leaves with the last Dalek. 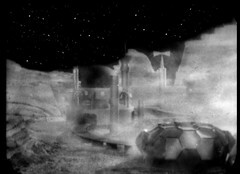 The Doctor & Jamie find Waterfield and jury rig the time machine to follow the Daleks, disappearing as the bomb detonates. Victoria & Kemel are held in a cell on Skaro: Maxtible visits them before leaving with a Dalek. The Doctor, Jamie & Waterfield have arrived outside the city. The Doctor finds a tunnel to the interior. Maxtible encounters a black domed Dalek, angry at his failure to bring The Doctor to Skaro. An alarm sounds: intruders are detected. 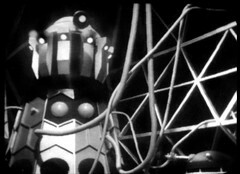 Dalek Omega is found by another black domed Dalek and taken away. Victoria is taken away by the Daleks and screams, attracting the attention of the Doctor's party who then meet Dalek Omega in the corridor. Dalek Omega is a fake, which the Doctor detects pushing it off a ledge to it's doom. 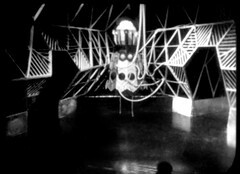 The Doctor's party reach the Dalek control room where they encounter the giant Emperor Dalek. JAMIE: Look at the size of that thing. EMPEROR: So, you are the Doctor. DOCTOR: We meet at last. I wondered if we ever would. EMPEROR: The experiment is over. DOCTOR: Yes, I have implanted the human factor in the three Daleks that you gave me. When I say run, run! DOCTOR: Promise me, Jamie. I was merely telling my friend that the day of the Daleks is coming to an end. DOCTOR: It's very simple. 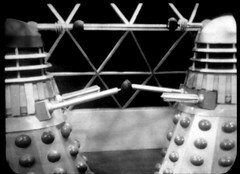 Somewhere in the Dalek race there are three Daleks with the human factor. Gradually, they will come to question. They will persuade other Daleks to question. You will have a rebellion on your planet! DOCTOR: I say yes. I've beaten you and I don't care what you do to me now. EMPEROR: Silence. The human factor showed us what the Dalek factor was. WATERFIELD: While you were doing one thing, they were really making you do another. EMPEROR: The human factor is useless. EMPEROR: They will be impregnated with the Dalek factor. Your discovery, but your work is not over. DOCTOR: I won't work for you. EMPEROR: You will take the Dalek factor. You will spread it to the entire history of Earth! Thus does the Dalek plan stand revealed. It's a bit like a typical Cyberman plan: over complicated and a bit rubbish. Can't they can easily travel in time themselves distributing the Dalek factor? So what do they need the Doctor for? The child Daleks are great, a contrast to the usual Dalek behaviour and unlike the servant Daleks in Power absolutely genuine. But no sooner are they introduced then they disappear, recalled to Skaro, Not Skaros, take note Mr Maxtible! In fact this whole episode is VERY fast moving and lots packed in with the Child Daleks, Bomb, arriving on Skaro, and meeting the Emperor. You feel some of this material could have been given a little bit more space and longer on screen compared to some of the things that dragged in earlier episodes. And finally, after six episodes hunting for it, The Doctor & Jamie find the Tardis! Still a bit of work to do before they can get it back though! We get to see the Dalek Emperor on screen for the first time here. There's been a Dalek Emperor in the comics for ages, a gold Dalek with a sphere shaped dome replacing the existing dome and neck. Many people later speculated that the Emperor might be Davros, TV creator of the Daleks, and in a self fulfilling prophecy the white domed but armless Emperor of Remembrance of the Daleks is revealed to be Davros. A Dalek Emperor is seen in the new series too in Bad Wolf & Parting of the Ways but that one's obviously a Dalek. You can't be sure when this story is set in Dalek chronology but my guess is this Emperor isn't Davros. If I had to point a figure at someone I'd be looking at the Dalek leader in Genesis of the Daleks. When I first blogged these episodes I had been listening to many of these audio only episode while out and about on buses and trains: Evil 6 was heard while travelling from Kingston to Richmond to get some lunch (very nice Dim Sum, thank you. Why can't you get Dim Sum in Swindon?) 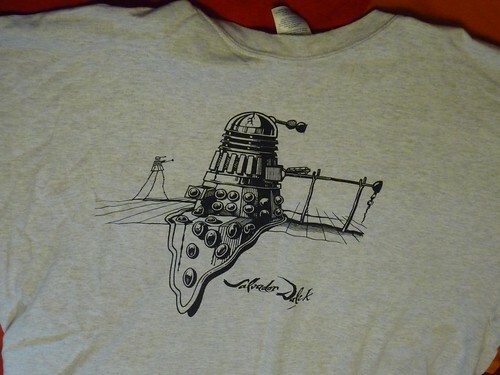 On the way back a chap sitting opposite me on the bus was wearing a Salvador Dalek T-Shirt, parodying the famous Dali painting of the melting clock! An odd coincidence! So for the first time since The Daleks we're definitely back on Skaro. There's a chance it might have appeared in The Space Museum & The Chase but the Dalek's base planet is unnamed there and could easily be Kembel or something else. 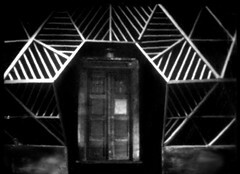 We get to see, both inside and out, a new version of the Daleks' city and because we get to see inside it it's a return for the familiar heartbeat sound of the Dalek control room noise. Skaro means yet more Daleks so we're joined by a fourth Dalek operator: Murphy Grumbar. 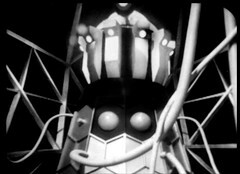 Under his original acting name of Peter Murphy he appeared in the Daleks and the Dalek Invasion of Earth before appearing as a Mechanoid in the Chase under his revised name. He'll be back in Day of the Daleks, Frontier in Space, Planet of the Daleks and Death to the Daleks as well as playing Arcturus in Curse of Peladon. There's a new type of Dalek here too: Silver ones with a Black dome. Their actual function isn't stated in the story but they're frequently described as Emperor Dalek Guards. 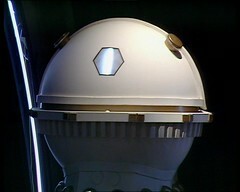 When the Emperor returned in the new series he too had normal Daleks with Black domes as his guards! There's every indication these Black domes are a last minute decision. In fact the Last Dalek, an 8mm film of special effects sequences for this story that you can find on the Doctor Who - Lost In Time DVD, shows a normal coloured Dalek having it's dome painted black on set!